Frida Day of the Dead Tin Wall Mirror in Red (12 in. ), "Frida Calavera in Red"
Creative Hands of Oaxaca promote the state's traditional handicrafts with this wall mirror. It depicts the iconic Mexican artist Frida Kahlo as a calavera, or skull. Colorful accents on the face, a cross at the forehead, and a red headband accentuate this cultural depiction of Frida, complete with mirrors in her eyes and nose. 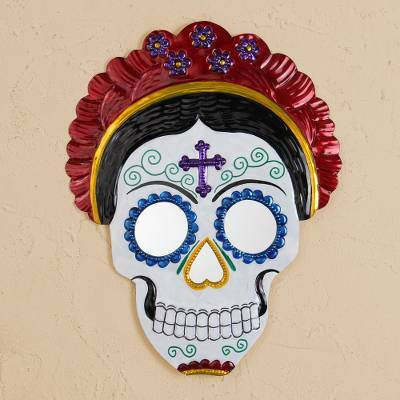 You can find tin wall mirror 'Frida Calavera in Red' (12 inch) by Creative Hands of Oaxaca in wall decor categories such as Cultural Mirrors, Day of the Dead Mirrors, Skull Mirrors, Frida Mirrors, Repousse Mirrors and Tin Mirrors. Enjoy exploring these sections for other Novica treasures.